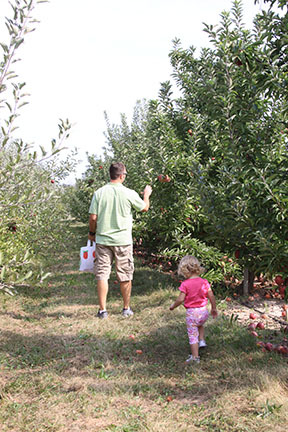 Two weeks ago, I went with my son and his family to the Eckert’s Orchard in Grafton Illinois for apple picking. We got really lucky that day because Eckerts’ in Grafton was celebrating their fiftieth anniversary and apples were only $.89 a pound. What a great bargain! We picked Red Delicious and Jonathans apples. All of us filled the large bags to the brim and the cost was minimal for what we got and we additionally had a great time! 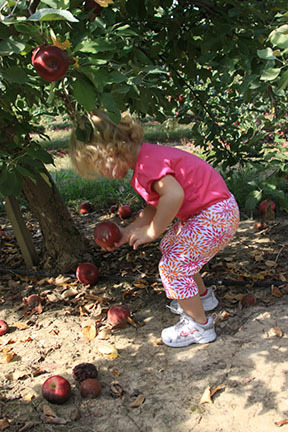 It was a little difficult to get my granddaughter to understand we needed to pick the apples off the trees instead of off the ground so we had to watch what apples she put into the bag.